Encodes the N-terminal fragment of transcription factor CIB1 (cryptochrome-interacting basic-helix-loop-helix). CIB1 interacts with CRY2 (cryptochrome 2) in a blue light-specific manner in yeast and Arabidopsis cells, and it acts together with additional CIB1-related proteins to promote CRY2-dependent floral initiation. CIB1 positively regulates FT expression. Cryptochrome 2 (CRY2) is a blue light stimulated photoreceptor, when exposed to blue light, it would interact withthe N-terminal fragment of CIB1 (CIBN) . Optogenetic systems enable precise spatial and temporal control of cell behavior. A light-activated CRISPR/Cas9 effector (LACE) system that induces transcription of endogenous genes in the presence of blue light.This was accomplished by fusing the light-inducible heterodimerizing proteins CRY2 and CIB1 to a transactivation domain and the catalytically inactive tCas9, respectively. The versatile LACE system can be easily directed to new DNA sequences for the dynamic regulation of endogenous genes. With different target loci have been tested by the usage of a GFP reporter plasmid(pCold-1) with a CSPA promotor. The target sites can be determined by directing the gRNA consisting of 20 bp length against the desired sequence of interest. F2 gRNA with target sites at different distances to the promotor regions proved successfully as potential activation sites (see Table 1 and Figure 3). Table 1: Overview of the tested gRNAs with different binding sites on the GFP pCold-1 plasmid. Figure 3: Position of the target loci on the GFP pCold-1 plasmid. To ensure the suppression efficiency of the gRNA, four gRNA sequences targeting different sites of CSPA promoter were designed and transfected into the E. coli strains BL21. Efficient suppression of CSPA promoter in strains BL21 was observed. GFP levels in GFP transgenic strains decrease after inserting a fragment that expresses CSPA promoter gRNA. And the sequence with the best suppression effect was selected for further study. only using different gRNAs targeted to CSPA promoter in BL21..
1-8: transfected with different GFP-gRNA plasmid (CSPA promoter) 9:Control group transfected with GFP plasmid,~27 kDa. Excitation wavelength: 488 nm, Emission wavelength: 509nm. Stationary cultures of BL21 was subcultured into fresh media and growth for 8 hours (1 3 5 7 9) or 16 hours (2 4 6 8) at 30°C. 30ng of protein with total volume of 30ul (protein sample + dissociation buffer). 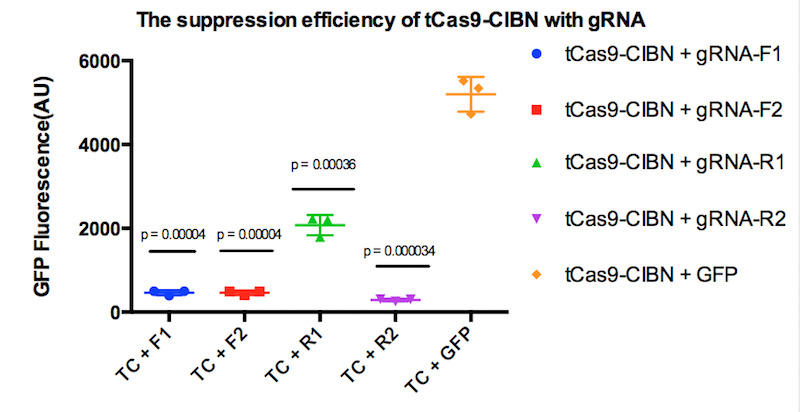 We next evaluated the effect of tCas9-cibn on suppressing CSPA promoter. GFP expression levels were assayed in strains BL21 after co-transformation with tCas9-cibn and gRNA. using different gRNAs targeted to CSPA promoter in BL21. 9 10:Control groups transfected with GFP plasmid and tCas9-CIBN plasmid(pBAD promoter), ~27 kDa. Excitation wavelength: 488 nm, Emission wavelength: 509nm. Stationary cultures of BL21 was subcultured into fresh media and growth for 8 hours (1 3 5 7 9) or 16 hours (2 4 6 8 10) using 15mM L-arabinose at 30°C. 30ng of protein with total volume of 30ul (protein sample + dissociation buffer). Compared with control groups, green fluorescence intensity and mRNA levels were dramatically reduced in groups treated with gRNA and tCas9-cibn. These results suggest that gRNA can specifically guide tCas9 to target upstream of CSPA promoter, thereby to inhibit CSPA promoter to reduce GFP expression levels. Spatially controlled activation of gene expression was achieved in strains co-transfected with the LACE system, a reporter vector containing a gRNA target sequence upstream of CSPA promoter and the eGFP gene. 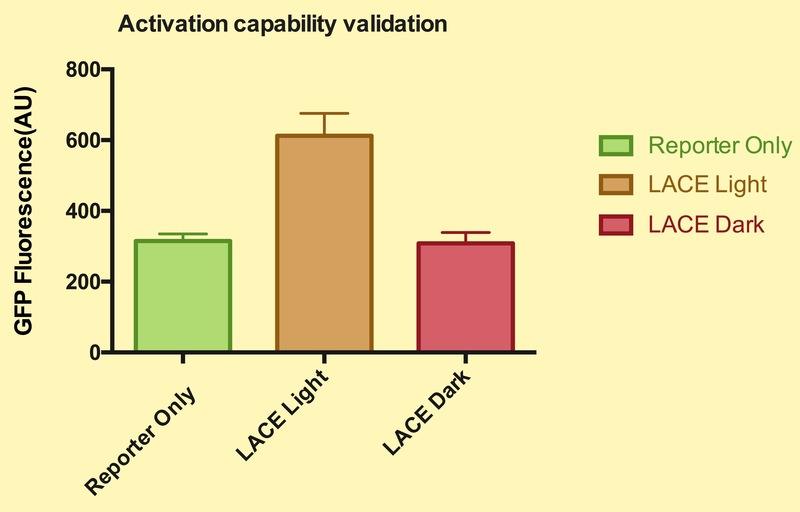 Strains transfected with light-activated CRISPR/Cas9 effector (LACE) and incubated in the dark did not show a significant difference in eGFP levels compared to control groups transfected with empty plasmid. 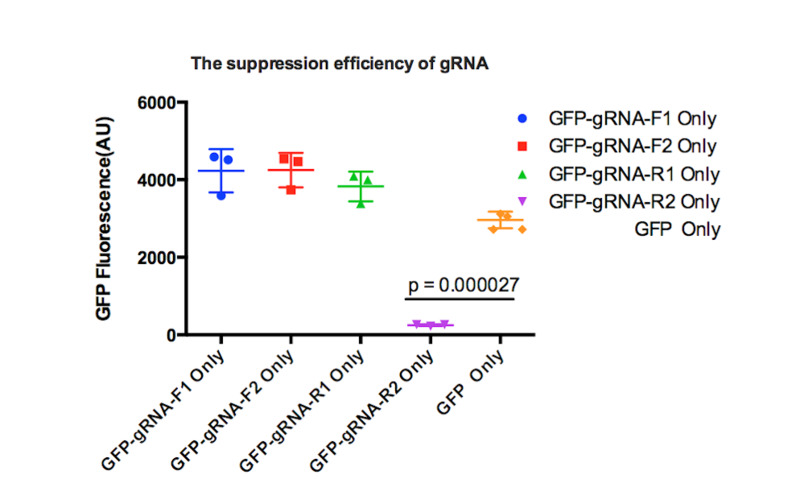 Strains containing the LACE system and gRNA exhibited significantly brighter eGFP fluorescence intensity when illuminated compared to when incubated in the dark.Activation of the eGFP reporter in strains transfected with the gRNA and LACE constructs, the gRNA and tCas9-VP64 expression plasmid or an empty plasmid as a negative control was quantified after 24 hours of illumination or incubation in the dark. Figure 6: Activation capability of LACE system using gRNA-F2 plasmid and tCas9-CIBN plasmid in BL21. Excitation wavelength: 488 nm, Emission wavelength: 509nm. Stationary cultures of BL21 was subcultured into fresh media and growth for 8 hours using 15mM L-arabinose at 30°C. Stationary cultures of BL21 pBAD was subcultured into fresh media and induced for 4 hours or 16 hours using different concentrations L-arabinose. Subsequent purification of protein from the cell-free supernatant and visualization using SDS-PAGE confirms that proteins of the expected size are present in the supernatant and hence most likely successfully secreted by the engineered bacterial strains. 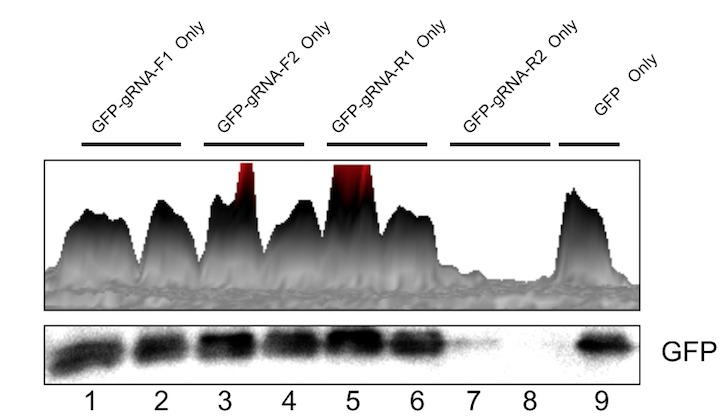 Figure 7: Western blot analysis of tCas9-CIBN protein levels. (pBAD promoter), ~180 kDa. Stationary cultures of BL21 was subcultured into fresh media and growth for 4 hours or 16 hours using different concentrations L-arabinose. 30ng of protein with total volume of 30ul (protein sample + dissociation buffer).